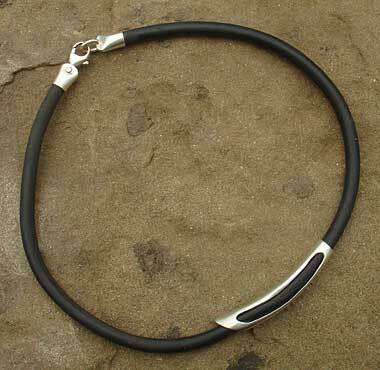 Men's Silver & Black Rubber Necklace : LOVE2HAVE in the UK! 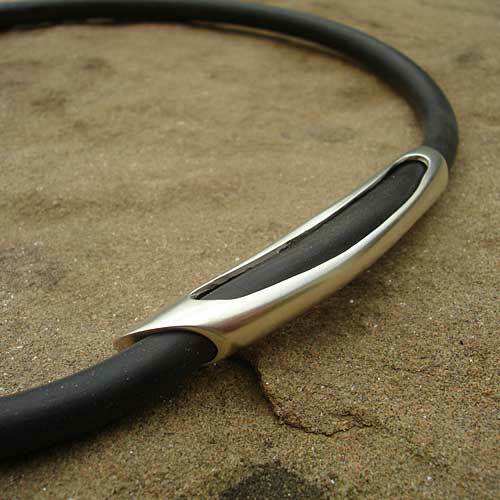 The very first point we need to make is that instead of leather this men's necklace is made from rubber and sterling silver. This piece is one of some pieces of our men's jewellery on our website created from this material that we decided to have specially commissioned for our customers. We love this idea as we know that not everyone wants a leather necklace due ever-increasing demand for all things vegetarian and vegan. A non-meat eater who is looking for style and making a statement to the world may wish to consider these pieces as an alternative. And what a statement piece this necklace is! It is very chunky and very bold in design in thick black rubber with a silver faceted window detailing. Not only that but it has a lovely organic quality to its design which is always very popular with our customers. The chunky silver window comes threaded onto a thick black rubber strap. The silver measures approximately 55mm by 10mm and the rubber measures 6mm wide. The necklace itself measures 18 inches long. It fastens securely with a solid silver lobster clasp. A fabulous piece of designer silver jewellery and an excellent example of handmade men's sterling silver jewellery for the fashion conscious shopper. Pictured also is this piece with a matching bracelet that is also available on our website. 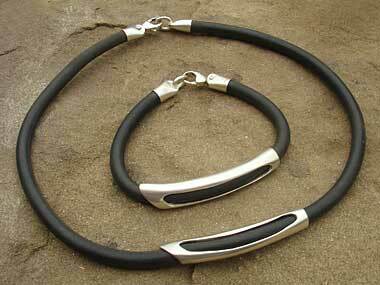 Metal(s)/Material(s) Available: 925 sterling silver and black rubber.